So first I thought a drawstring bag , then a wallet type with a flap and maybe a Velcro closure. 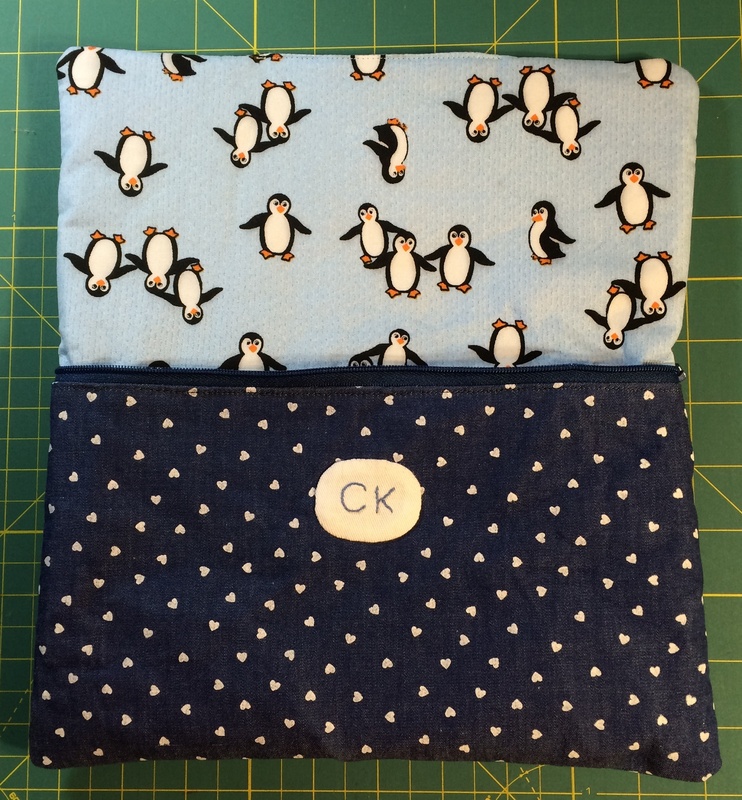 But in the end I decided on a zippered pouch. This past weekend I finally got around to make it and it turned out great. The friend was very happy with it. 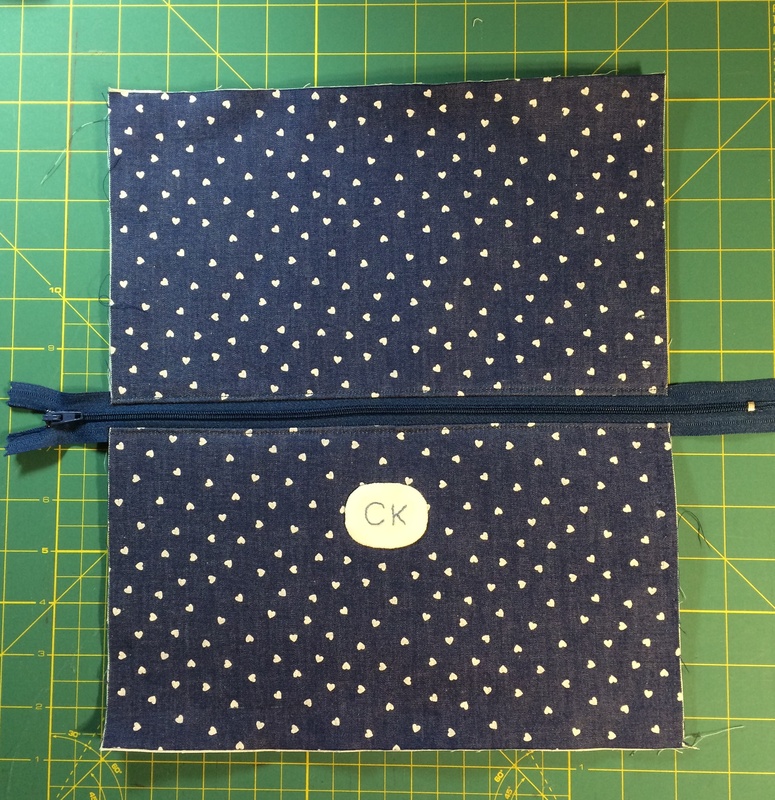 I made it like a large pencil case and added iron on batting to the lining fabric and iron on woven interfacing on the outer fabric. 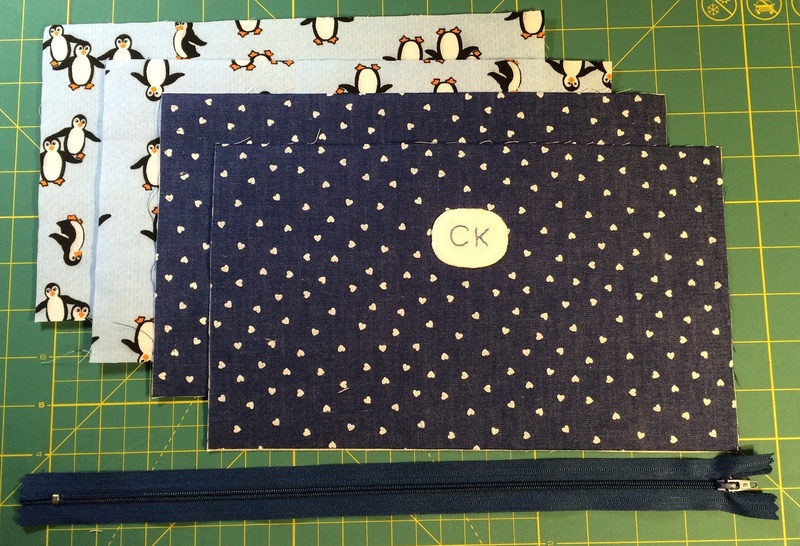 I used a thin denim with printed small hearts for outer fabric, a penguin print cotton fabric for lining and a 14″ zipper. Cut 2 pieces of outer fabric, 2 pieces of lining fabric. 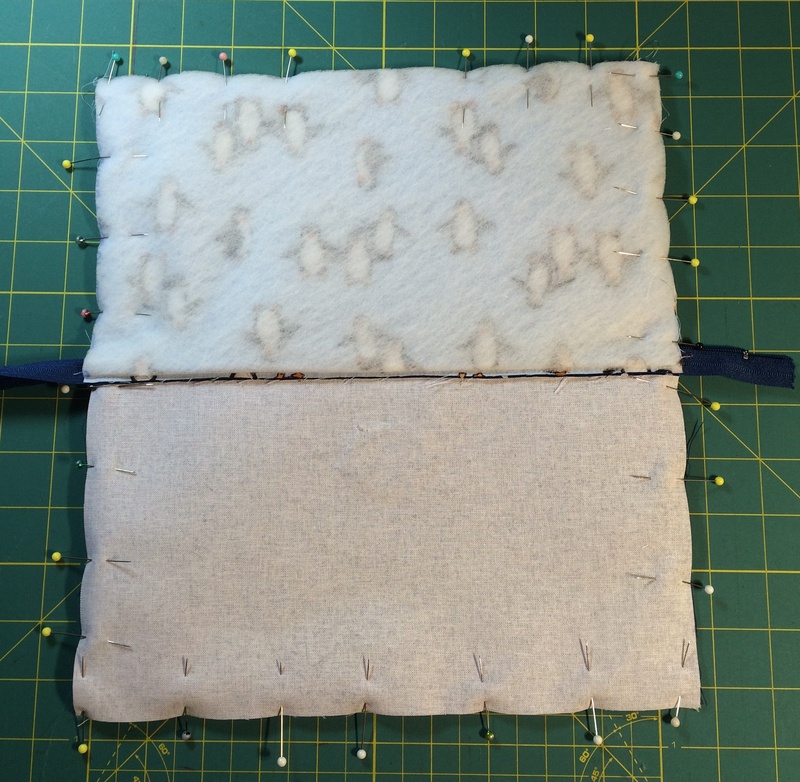 2 pieces of batting and 2 pieces of interfacing in the same size, in this case 6 1/2″ x 11″. Iron on batting to lining pieces and interfacing to outer pieces. 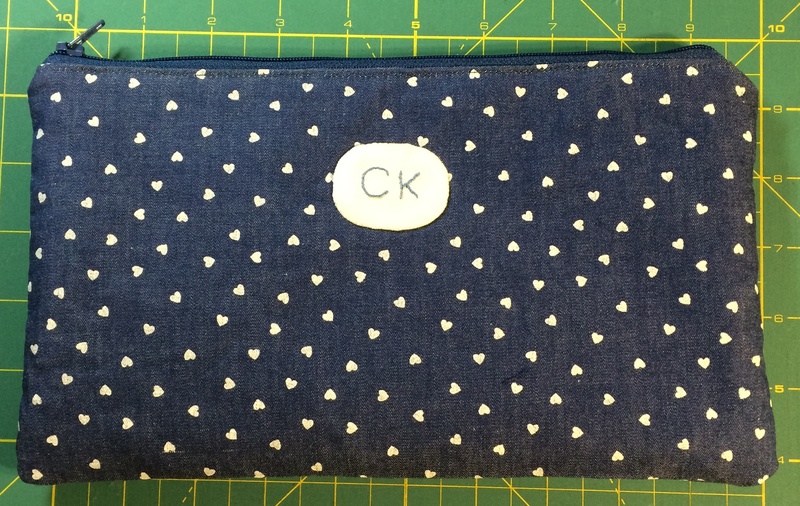 The lettering on my sewing machine isn’t working anymore so I embroidered the initials with a back stitch on a small piece of fabric that I appliqued on the front of the case. Sandwich the zipper by placing it face down along the top end on the right side of the outer fabric and the lining right side together with the outer fabric. 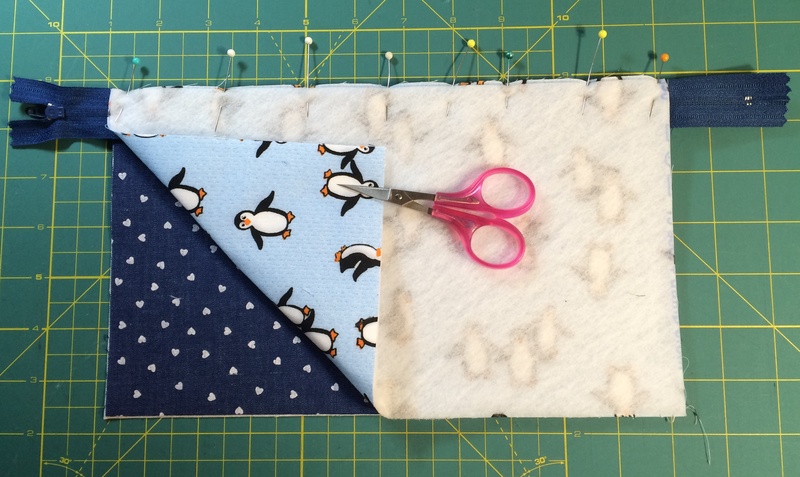 Stitch through all layers with a 1/4″ seam allowance. Repeat for the other side. Fold the pieces away from the zipper and top stitch close to the edge. Open the zipper about 3/4 of the way. Pin main fabric pieces right sides together and pin lining pieces right sides together. 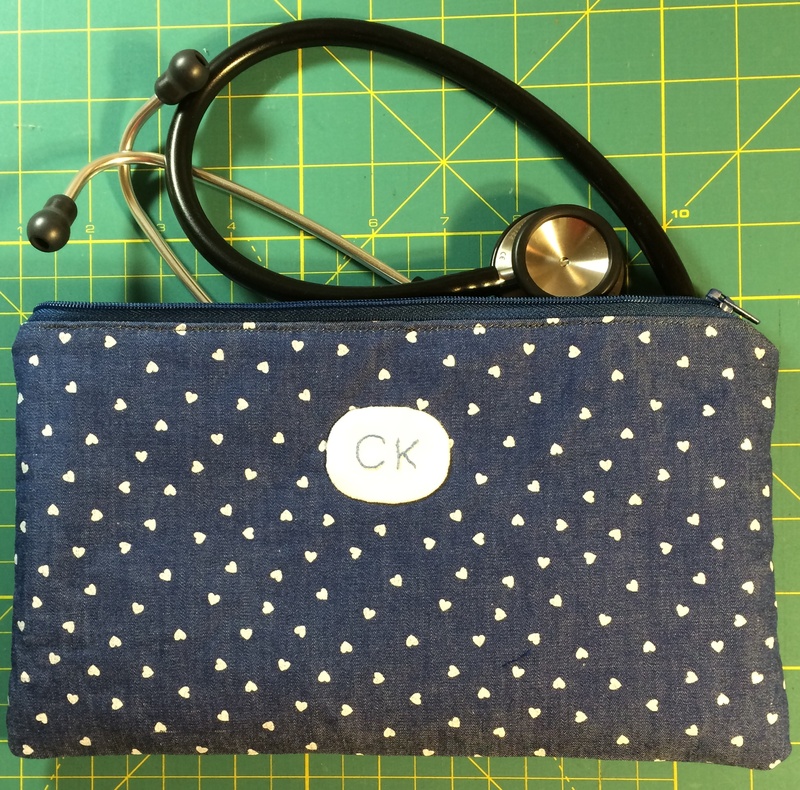 Sew all the way around, leaving a 3″ opening in the bottom of the lining. Trim zipper ends if necessary, turn to the right side through the opening in the lining and sew the opening closed. Push the lining inside the pouch and you are done. I am making another one this weekend. Have you ever had any odd crafting requests? P.S. I am working on a new pattern. I Think it is a very nice one. And it is a very good thought with a heart shaped fabric!